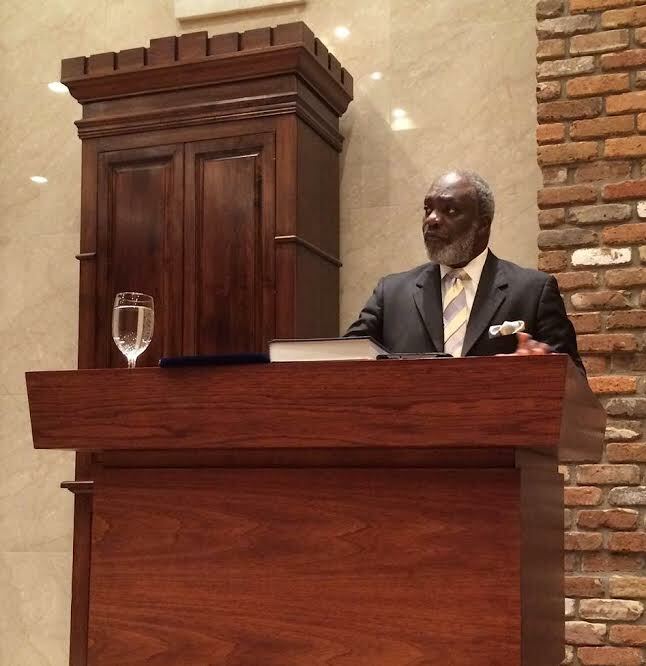 Above: Pastor Milton Saffold of Stone Street Baptist Church in Mobile spoke about racial reconciliation last Shabbat at Springhill Avenue Temple. Sen. Bernie Sanders will hold a campaign rally in New Orleans on July 26 at 6 p.m., at the Pontchartrain Center in Kenner. The night before, he will speak at the Louisiana Democratic Party’s Jefferson-Jackson Dinner. Food Republic asked New Orleans chef Alon Shaya to share what he found on his culinary trip to Israel this summer. Israeli NBA star Omri Casspi is bringing a delegation of NBA players to Israel this week as part of a foundation he established to fight BDS. Tyreke Evans of the New Orleans Pelicans is among those on the trip. Chabad expanding its presence in Shreveport. Rabbi Barry Block of B’nai Israel in Little Rock talks about being moved from the Greene Family Camp, where he has gone since 1977, to the Henry S. Jacobs Camp when he moved to Arkansas, and how Jacobs has now become home. A newcomer to Mississippi, working for the Institute of Southern Jewish Life, relates how many people told him he was crazy for moving to Mississippi. While trying to furnish an apartment, he answered a Craigslist ad — and was shocked at the seller’s reaction to meeting him. Police in Louisville, Ky., arrested a man for leaving a threatening note at the Jewish Community Center. Birmingham’s Temple Beth-El will have Shabbat mincha at 5:30 p.m. on July 25, moving Ma’ariv to 8:30 p.m., with the reading of Eicha. Temple Emanu-El in Dothan will have a brief service at 8 p.m. on July 25. Ahavas Chesed, Mobile, will have a “somber and meditative service” on July 25 at 8 p.m.
Shir Chadash in Metairie will have a pre-fast Seudah Shlishi at 7 p.m. on July 25, “accompanied by learning and soulful singing to transition from the joy of Shabbat into the mourning of the fast day.” Havdalah, Ma’ariv and Eicha will follow at 8:40 p.m. On July 26 there will be Shacharit, Torah reading and Eicha at 9:15 a.m.
On July 31, You Belong in Birmingham will have a Shabbat at Temple Emanu-El, with cocktails at 5:15 p.m. and dinner following the 5:45 p.m. service. Birmingham native Kevin Berkowitz will speak about "Jews in Greece" at the July 24 Shabbat service at Birmingham’s Temple Emanu-El, at 5:40 p.m. An oneg will follow. Berkowitz has lived in the Balkans for the last 12 years — two years in the Former Yugoslav Republic of Macedonia and 10 years in Thessaloniki, Greece. He works as a tour guide specializing in the history of Greek Jewry, the Balkans and the Near and Middle East. He also teaches robotics at a Thessaloniki primary school. Chabad of Mobile will hold a Jewish Learning Institute course, “Justice and the War on Terror.” Part 2 is July 29 at 7:30 p.m. at the Hampton Inn on Providence Park Drive. The sessions, “Negotiating With Terror” and “Torturing to Save Lives” are CLE accredited. The eighth annual Temple Beth-El Poker Tournament in Pensacola will be on August 15. Due to renovations, the event will be held at 917 North Palafox. Doors will open at 5:15 p.m. and no-limit hold’em play begins at 6 p.m. The buy-in is $100 for the first 100 who pre-register, or $110 at the door. Re-buys of $100 are taken until 8 p.m. Registration and re-buys are for $3,000 in chips, and there will be a one-time add-on of $5,000 in chips at 8:15 p.m. for $100. There will be free food and a cash bar. The top nine players will receive non-monetary prizes, with first place being a Large Green Egg and second place being a flat-screen television. The Synagogue Softball League playoffs in New Orleans will be held on Aug. 2 at Miley Field in Metairie, weather permitting. The 8:30 a.m. match pairs second-seed Shir Chadash with third seeded Gates of Prayer. Top seed Temple Sinai meets fourth-seed Beth Israel at 10 a.m. The higher seeded team is considered the home team. The championship game will be played at 11:30 a.m. Last year, Gates of Prayer won the championship over Touro Synagogue. Basic J, the Introduction to Judaism course at Gates of Prayer in Metairie, will begin on Aug. 5 at 7:30 p.m. and continue on Wednesdays through the year. The course is taught by Rabbi Bob Loewy and Rabbi Alexis Pinsky, and is open to all interested in learning primary beliefs and practices in Judaism, especially those interested in being supportive of a Jewish family or conversion. B’nai Zion in Shreveport is holding a summer film series following the 6 p.m. Shabbat services. Pizza, popcorn and drinks will be served, and each film has a Judaic tie. Admission is free, but donations are appreciated before or after Shabbat. The July 24 film will be “O Jerusalem,” and the 1977 classic “Oh, God!” will be on July 31. The Chabad Center in Metairie will have a Hebrew reading crash course for beginners, starting Aug. 2 and running for six Sunday mornings.